Lovely cupcakes that look great and taste even better. They are made with mix of soy flour and ground almond. If you don’t have soy flour you can use the ground almond only (remember to double the amount). I love the frosting but it’s quite high in calories. If you want to make it a bit lighter use less frosting for decoration or skip butter and use cheese only. Keep them in the fridge as frosting melts a bit. 2. In medium bowl mix soy flour, ground almond and baking powder. 3. In a large bowl whip egg whites with cream of tartar (with electric mixer it takes only few minutes). 4. In a separate bowl, using electric mixer, beat eggs yolks with butter until yellow and fluffy. Add vanilla extract and sweetener and mix all together well. 5. Add 1/3 of whipped egg whites to the eggy mixture and using spatula fold it in as gently and slow as possible. Fold the whole mixture into remaining egg whites and again, fold it in as gently as possible. 6. Add half of mixed flours and fold it in gently. Add remaining flour and repeat folding in. 7. Divide the batter into cupcake cases about ¾ full. Bake for about 15-20 minutes. 1. Using electric mixer combine soft butter, cheese and splenda. 2. Decorate cupcake using piping bag. 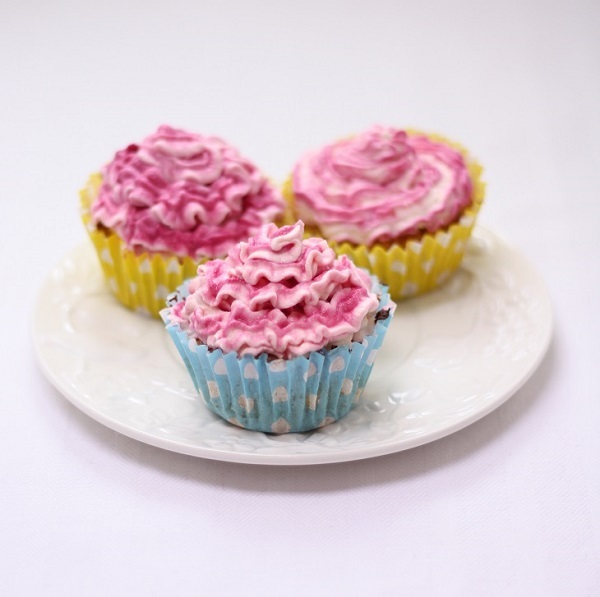 If you want to have these lovely pink swirls add few drops of food colouring to the piping bag (pour few drops on the side of the bag).